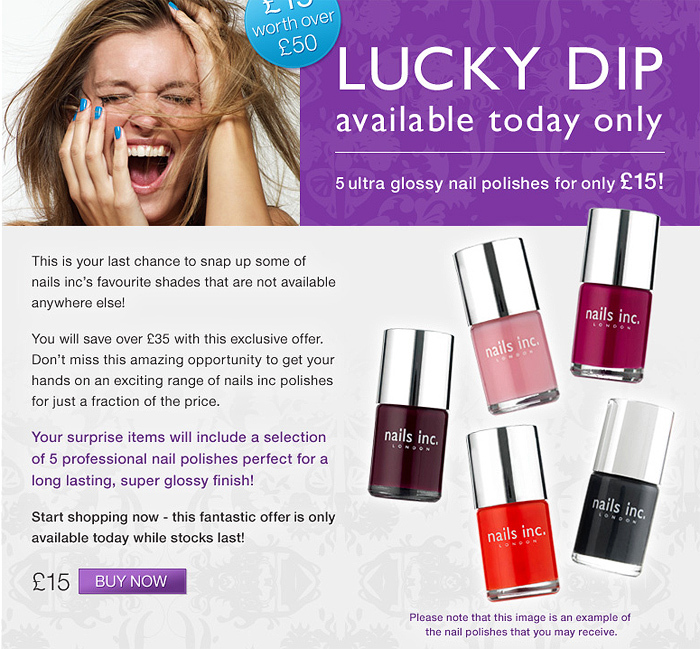 Available until midnight tonight, Nails Inc. are offering a lucky dip. 5 polishes for £15, that works out at £3 a polish! I’m very tempted, but a bit worried about getting a envelope full of ‘wine’ coloured polishes… I don’t like maroony, clarety shades. Are you tempted? The 4 year old in me loves lucky dips! I could be very tempted, but I’d also worry about getting unsuitable colours. It’s only £3 a polish if you like all the ones you get! Ooo! I kind of wish I hadn’t seen this because I am SO tempted now… I don’t like reds or pinks though which pretty much guarantees I’d get some! do they choose at random any polish from the 43 displayed on the ‘show me all polishes’ here http://www.nailsinc.com/products/nail-varnish-colours/40/?all= (which does not include the ice cream collection for example, and all the ‘care’ ones, base, top coat) or can you receive any polish at all? Umm. … Then again, £3 is not bad a price. If you’re looking for a reason NOT to buy it, just remember the main reason why you havent got more nails inc in your collection: the application or the brush right? Lucky Dip: perfect opportunity for them to flog their unwanted crap. They have 50000 marooon to get rid of haha. ahah thanks! i am also worried about the silly colours they may put in lol. i got a lucky dip bag from the clothes show live this year which turned out to be good (i liked 3 out of the 4 i got!) whereas my friend’s bag was just ‘mehhh’ ! @JeweledThumb – tough, you’ve got Stila and their mega sales! @Gemma – Actually I need to record you simply saying something like “Do you REALLY need that?” in a disapproving voice… I’ll set it on a loop and should be much wealthier this time next year! @Liloo – I know! I have a love/hate thing going on with their formulas. I’ve dare tried any of those ‘mystery’ type purchases. I’m always suspicious that if you’re committing to buy something you can’t see the company is probably going to rip you off and give you the unwanted and unsellable items. I know some people who have tried things like my little pink box, but I just don’t wanna risk my hard earned money! not that i would use it? Yay! Im a sucker for a lucky dip!